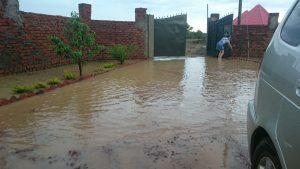 As James & Sarah traveled home¬†from a trip to Mbale this month they¬†hit torrential wind and rain¬†and came home to house and garden completely flooded. However¬†after an hour of moving the water out of the house they had it pretty much back to normal. But¬†the next day they met with the girl who delivers their water, Tino and discovered the weather had¬†blown her roof off. The damage was something you see on the news after a hurricane. Tino lived in a 5×7 foot room with her 3 children, Joshua, Winnie and Mercy. 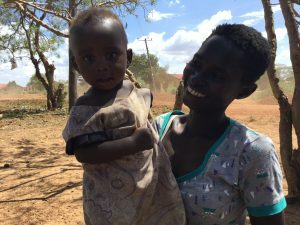 Both Tino‚Äôs parents died in 2013 and 2015, leaving Tino the room, and the father of their kids left her in October with no source of income or support except¬†what she earns from delivering water. Tino’s day starts before 6 am to join the queue¬†at the water pump. She¬†fills¬†six 25 ltr Jerry cans which she carries on her head in 30+ heat and sells for 12.5 pence a can. It‚Äôs a good week if she makes ¬£5. From this she pays for food, household items, school fees for Joshua (she cannot afford to send Winnie to school, who¬†will probably have to carry water like her mother) and any arising bills such as malaria medication. Her only option to house herself and her children is to move into rented accommodation at ¬£7.50 a month, which means she will never be able to save the money needed to rebuild the room her father left her. 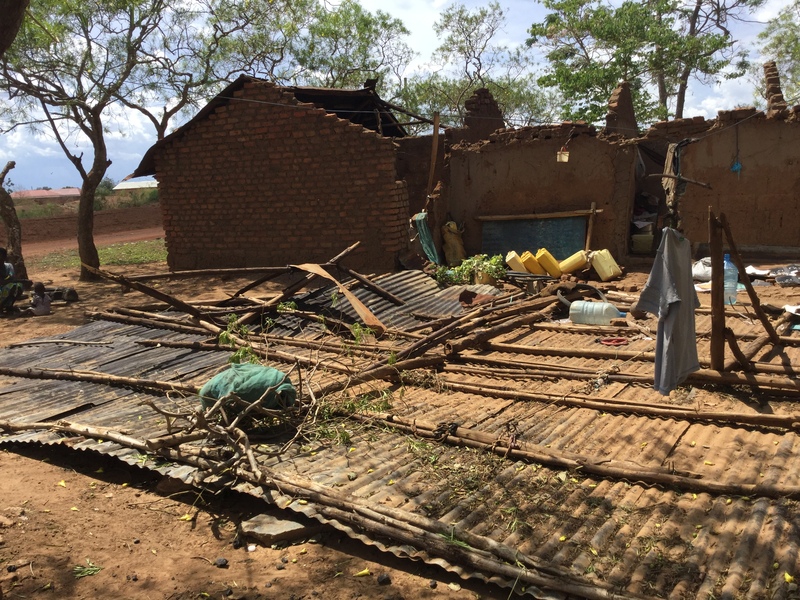 This rain was the first of the rainy season, it will soon rain every day, and every so often it will be torrential like the weather that swept away Tino’s roof. Can you support Tino and her kids by building her a house which is safe and secure from the wind, rain and sun? Let’s¬†give Tino something which she would never be able to get¬†by herself! 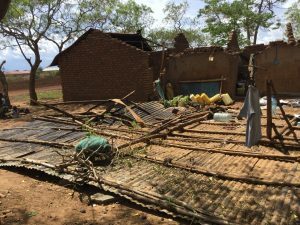 We need¬†¬£1400 to purchase the materials and pay for the labour to re-build Tino’s home and give her family shelter from the storms. Please donate here and see how you can help achieve our target!